Shadows have their own beauty and life. They are everywhere and yet pass unnoticed. When a body goes behind a screen to become a shadow - a transformation takes place and we watch the shadow with a new and keener kind of attention. Shadows appeal to something basic in us - the desire to be entranced. Louise is a theatre director, award-winning filmmaker, performer and puppeteer. 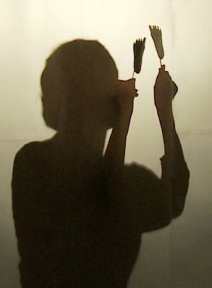 She discovered shadow theatre in a Yuki Murumatsu workshop while studying at the London School of Puppetry. She went on to study shadow and light technique further with Norbert Goetz of Theater der Schatten in Germany. Her recent work with Reel Islington enabled her to initiate the UK's first Puppets On Film festival in collaboration with the Little Angel Theatre. Angeliki hails originally from Greece where her first experiences of puppetry began with the traditional shadow theatre of Karagoz. Studying and working in the UK in the social sciences she started her training in puppetry at the Central School of Speech and Drama and since then continues to evolve as a puppeteer with studies at the London School of Puppetry, Little Angel Theatre and Norwich Puppet Theatre. She has been a regular assistant at the adult maker classes and the childrens’ puppet club at Little Angel Theatre. Recently she has started to develop and run workshops for adults by using puppetry as a tool of empowerment and self-development. Chand has worked extensively in theatres as an actor and puppeteer. As well as collaborating with other artists in the field he devises shows, and designs and constructs puppets with his own company. His latest show The Chronicles of Bitter and Twistedwas well received at Edinburgh this year and will be showing at the Little Angel Theatre and the Arcola Theatre next Spring. John taught drawing at the London College of Furniture (now LMU) for over 20 years. He has exhibited at the Royal Academy and other London Galleries. He played Hamlet in the first production of Rosencrantz and Guiildenstern, and was an original member of the Brighton Combination. He has staged performances of his work at the ICA and various North London Festivals.